So you know that saying second times a charm? I totally believe that sometimes when it comes to projects. Probably because I have had a lot of doo-overs in my day. 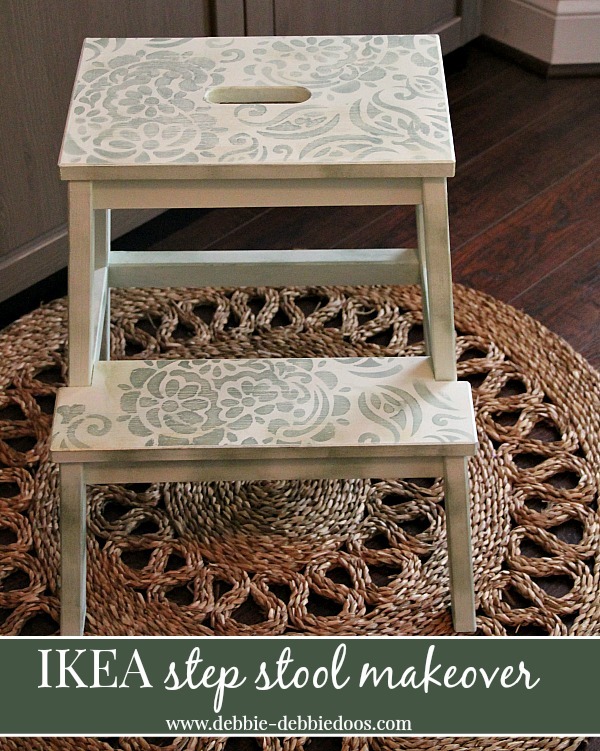 Today I am sharing and IKEA step stool makeover. 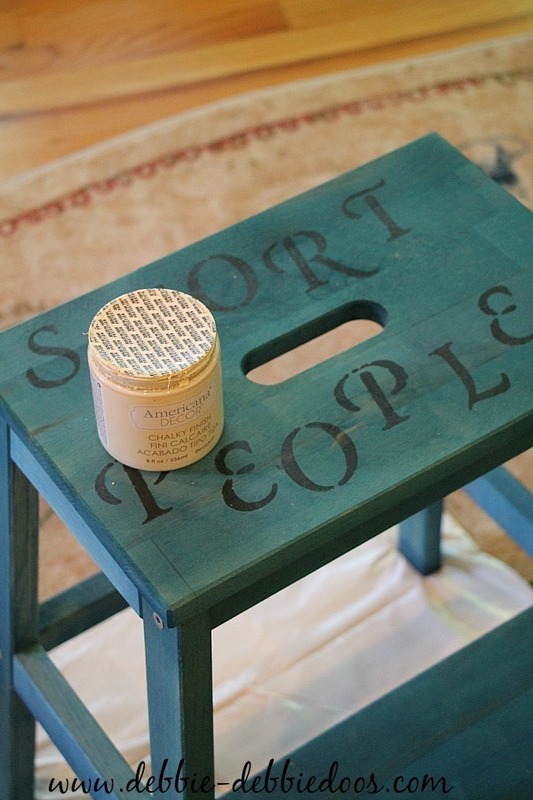 Certainly couldn’t just leave this step stool plain jane as it is. Here’s the funny part. I never even shared with you the first makeover I did on this all natural wood stool. 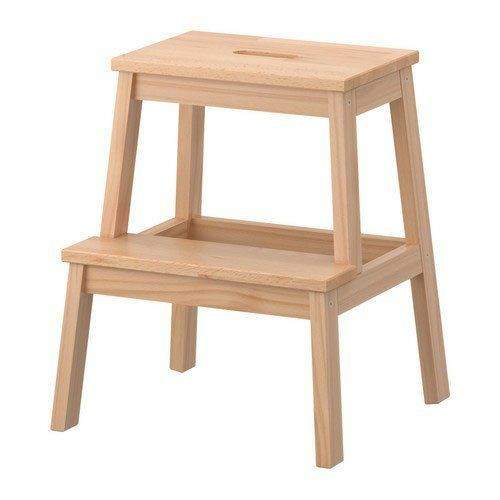 We needed this step stool after Mike did the Ikea closet unit in our masterbedroom. I will share that process with you in the future. It wasn’t a favorite project of mine, and more so because it just didn’t really match the room. I used chalky paint by Americana decor to cover the first job I did. I wound up using the entire jar of it. It took at least three coats to cover up my first job. I used this stencil back a few months ago on a layered stenciled pillow design I shared. I love paisley and you will see soon our Master bedroom spruce up involves more paisley print. I used Deco art craft paint for my stencil design and then rubbed on the same color over my chalky paint lightly. I then distressed lightly and called it done. Much better. And that is why I say second times a charm! Thanks for stopping over today. Always a pleasure to have you. If you are not a regular, I sure would love to see you back again. 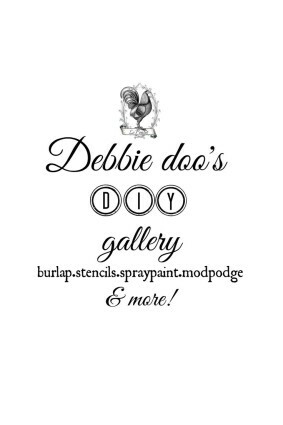 Check out my Gallery of Stenciling ideas if you have a spare minute or two. Or if you like the Dollar tree..you can stick around even longer and browse through all my ideas. Love the stool Debbie, both the first and second version. 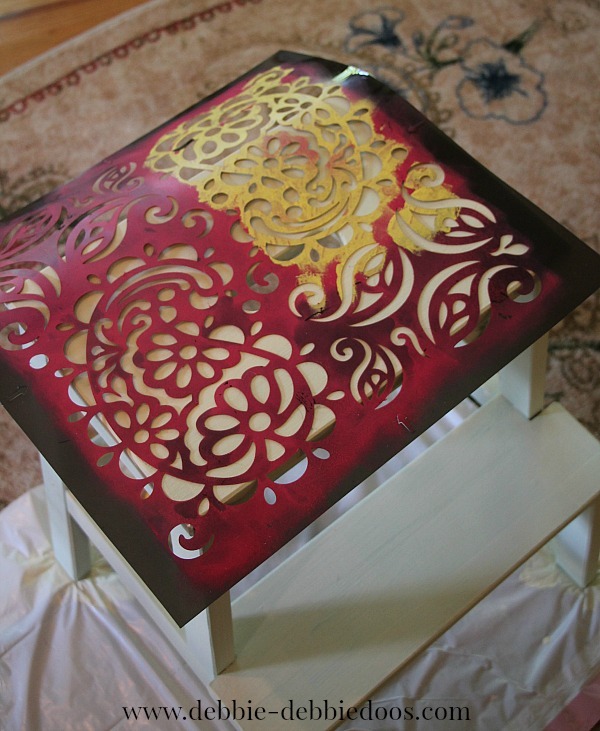 The redo is really pretty though and the stencil and paint treatment look amazing. Love the new make over of the stool. It looks so cute now! Thanks for joining in, Debbie! Loooove this Deb. So cute. Happy Week End. I like them both! It’s great how you can change it up when the mood strikes! So cute Deb. Like the soft colors too. Love the second makeover. Classic and pretty. Love the muted stencil pattern. Cute idea! 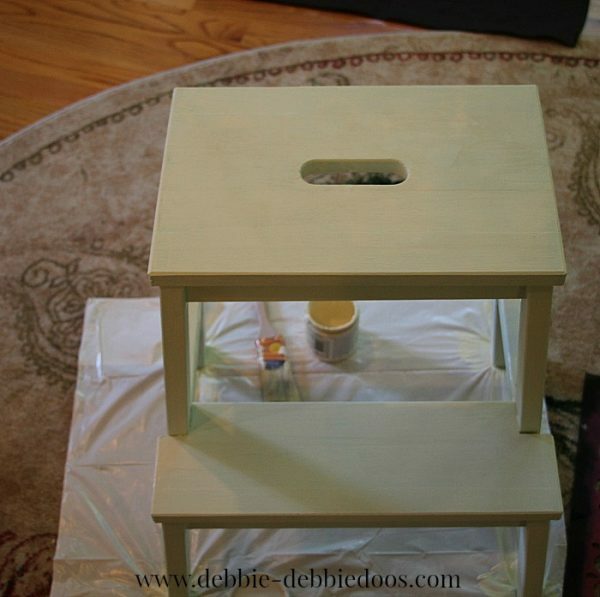 That step stool looks great, Debbie! I love the size of it, too. I need a two step one like that for my granddaughter so she can reach the bathroom sink. I really need to make a trip to Ikea. 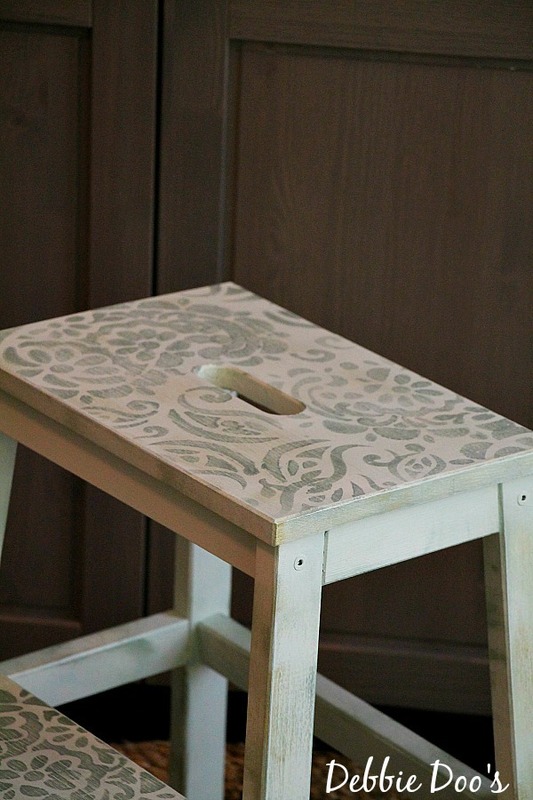 Embellishment is always a good thing….Pretty, pretty stool Debbie!!! 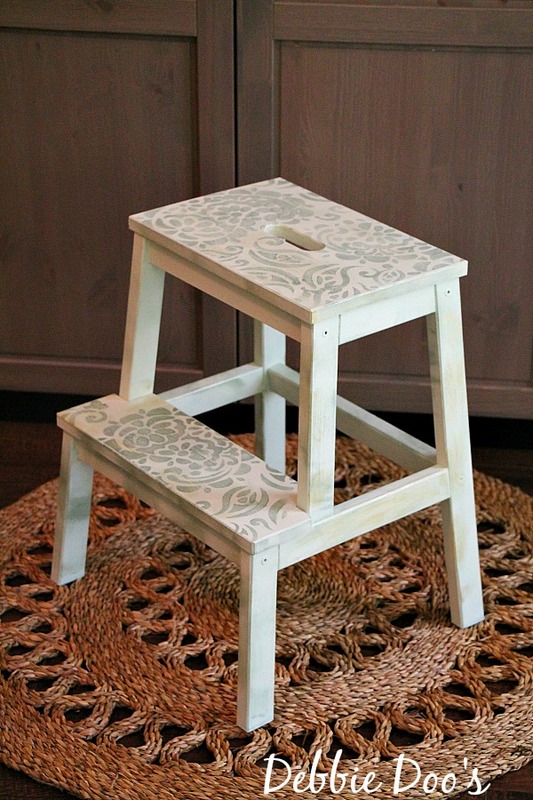 This stool is so cute! My mom teases me about my stool addiction. I can’t pass one up:) Over the weekend I got 2 from Goodwill and 1 from craigslist:) Maybe I do have just a little problem;) lol Have a wonderful day! This is a great re-do, Debbie!